I have a confession to make. I was a falsie virgin until recently. Yes, it's shameful - in the three decades of my existence, I've never really bothered to look into false lashes. Sure painting on colours with eye shadows and liners is OK with me but attaching things to my eyes? No Way! I think it was the fear of sticking something so close to my eyes and the risk that clumsy me might poke my eye out that held me back. For that reason, I'm also a circle lens virgin. I can't imagine sticking my finger into my eye no matter how safe or harmless it really is (thank goodness I don't need glasses/contacts or else I'd be in trouble). I am very happy to report though, I've since overcome my fear and have been trying to master the art of false eyelash application as I've come realise how much it can transform your eye and looks - more so than any eye or face makeup colour alone can. It really opens up and enlarges my relatively small eyes, allowing me to achieve looks I didn't think was possible before. Being a newbie with lash application, I've had lots of trouble and found a few things that helped and thought I'd share this with those who also find it tough to apply these little suckers. Before application, make sure you measure the lash against your eye to check for fit and cut it to size. The type of eyelash glue you use will make or break your application (not to mention test your patience). The little tube of glue usually included with most false lashes are rubbish and will just frustrate you during use so toss it out and buy a proper lash glue. Don't think about skipping this step to save a few dollars because it is not worth the grief (trust me, I learnt this the hard way). Most people use Duo lash glue but I find that Asian lash glues with its thin brushes gives the easiest application. Apply a thin layer of the lash glue directly onto the lash band and wait 20secs for it to slightly dry and become tacky. Then it's ready to be applied to eyes. Some people use tweezers to apply the lash to the eye, but I find fingers and the slanted end of a wooden orange tip more helpful with pressing down the lash band againt edges of the eye and helping it stay put. Brush on a little bit more glue if the edges are sticking up and then press it down for 10 seconds. Use liquid eye liner AFTER appication to hide the edges/ends of the false lashes by extending the line slightly beyond the ends of the eye. If you are using liner before lash application, it will just smudge off with you adjusting your lashes around during the application. Use an eyelash curler to curl your real and false lashes so they blend in together. A coat of mascara helps achieve this even more. Highlight the inner corner of the eye with a white/light highlight colour to brighten your peepers. Your eyes may feel slightly weird initially as there is now a foreign object fluttering against it but if you applied the lashes right, it should not hurt or feel uncomfortable. Removal is easy with a waterproof eye makeup remover as it will dissolve the glue from the lash band and any mascara you have applied. 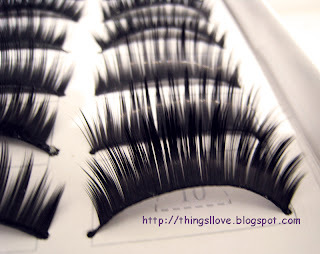 Store used lashes in a small plastic container if you plan on re-using them. If you clean the false lashes well (with waterproof makeup remover) and don't rip it during removal, you can get a couple uses out of it before it starts to look mangled and needs to be tossed out. Dramatic lashes - va va voom! 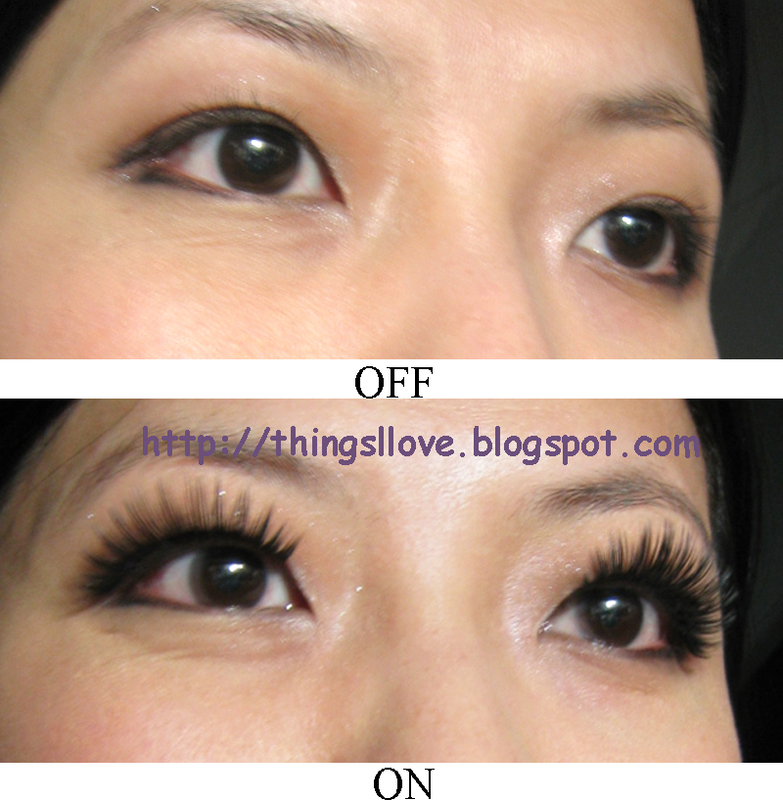 As you can see from the photos above, my eyes are totally transformed using a set of falsies. If you are like me and are scared of false lashes, don't be - they are fun and with a bit of practice, you too can master it and create exciting new looks that just can't be achieved with colour alone. I'll be doing separate review posts on the lashes and lash glue so be sure to look out for those. Wow! That really is a transformation! I have fairly defined / noticeable lashes already, so never tried the falsies either.....but after your really helpful instructions and the pics - I might just give it a go one of these weekends! Ah you're very lucky to be naturally blessed Melbournite. I wish I didn't need to look into applying false lashes too but I'm not so blessed.